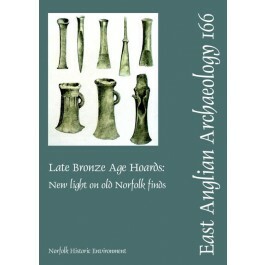 This report presents evidence for the discovery of Late Bronze Age hoards in Norfolk before 1950. Three of the finds were made during the eighteenth century, possibly a dozen more during the nineteenth century, and a further three during the first half of the twentieth century. The evidence has been derived from the historic manuscripts, correspondence, drawings and publications of a small group of antiquaries, most of whom lived in the county. Short biographies of the principal antiquaries are presented. A review of the discoveries made after 1950 notes the acceleration in the rate of new finds, especially from the 1970s when the use of metal-detectors became popular in Norfolk. The first report of a new Late Bronze Age hoard site in Norfolk, marking the start of the ‘metal-detector era’, was made on 16 September 1977, and thereafter the majority of new hoard finds have been made by detectorists. The enhancement of the collection of bronzes from a site at Snettisham (IV), as well as the discoveries of new hoards at Snettisham (V), Hockwold and Great Melton, all with the use of detectors, are described to illustrate the range of objects that may have occurred in the earlier discoveries. Only two of the hoards described were made up of weapons, the others being of mixed composition with variable numbers of tools, weapons and industrial products. Although a few of the individual components may have originated in the Penard, Wilburton or Blackmoor phases of the British Late Bronze Age, and a few in the later Llyn Fawr phase, the majority of the finds are attributed to the Ewart Park phase of the ninth and tenth centuries (cal) BC, some with Carp’s Tongue (or Boughton-Vėnat) affinities.